So what is difference, well my first impression was that they were slighter than the present sculpts. They may also be a little less sharply defined. But of course you can judge this your self. The Maltese cross on the caps was also much more raised and was easier to paint. I likee this. One striking difference was the cap, in the old Calpe's the cap on the top is not flat but rather is raised n the centre. The new sculpts have a flat top. I like the old sculpting style here. The back of the figures illustrate though definite improvement in the sculpting. 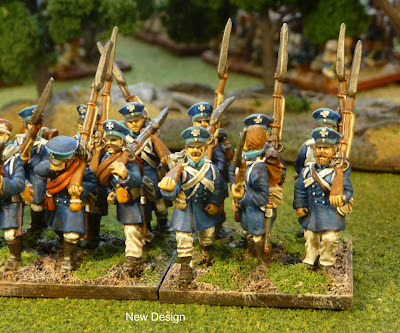 I really like the buttons on Calpe figures and as you can see they are missing on the older sculpts. I also believe the details on the accruements are better defined on the new figures. So in summary, I really like both generations and have no preferences. 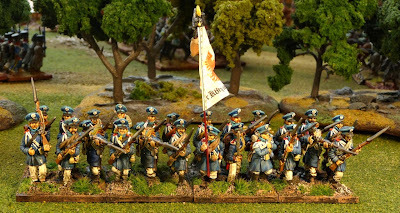 Update Vorwärts Montreal: Well first I should say that I have no photos, I will rely on Iannick to post these, and I am sure that an AAR will appear soon on his blog. I believe, however, that it would not be unreasonable to report that I finally won a game. It was also the first time that I played a game with more than 2 players and it was really a lot of fun. Myself (Grande Armee) and Nicolas (Bavarois), a recent transplant to Montreal from France, played an excellent game and captured the centre and one of the villages in the La Bataille pour les Deux Villages. By now I had the Black Powder rules pretty well down and although it was Nicolas's first BP game, he was clearly an experienced Napoleonic war gamer, which was enormously helpful to us. The brothers Martin played a fair game, Gabriel (Prusse) playing his first Napoleonic game, captured one village and held on gamely against repeated assaults from my French. 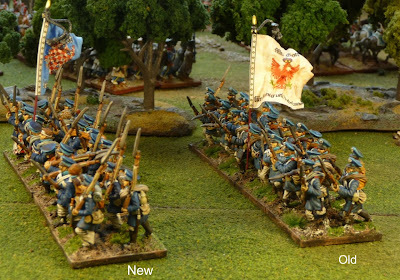 It was of course only time before the Français would have taken the village, as his supports were systematically defeated by my tactical skill! Really it was the overwhelming force, but it is nice to believe I played well after all my previous defeats. 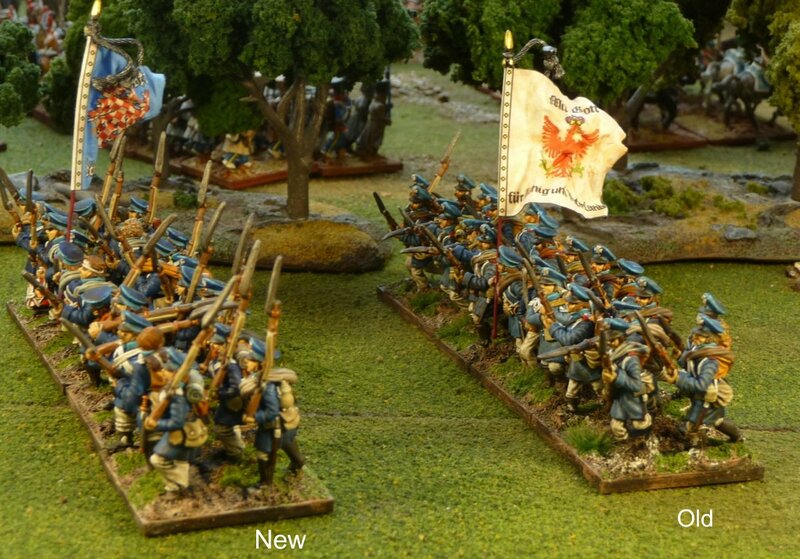 Iannick (Autrichiens) really had a tough time of it, as his troops just seemed to stand there! We all had a great time though, all got along very well, had some drinks and I am sure a rematch is is in the offing. Great looking figures, I cant really tell a difference between the old and new apart from the pose?? 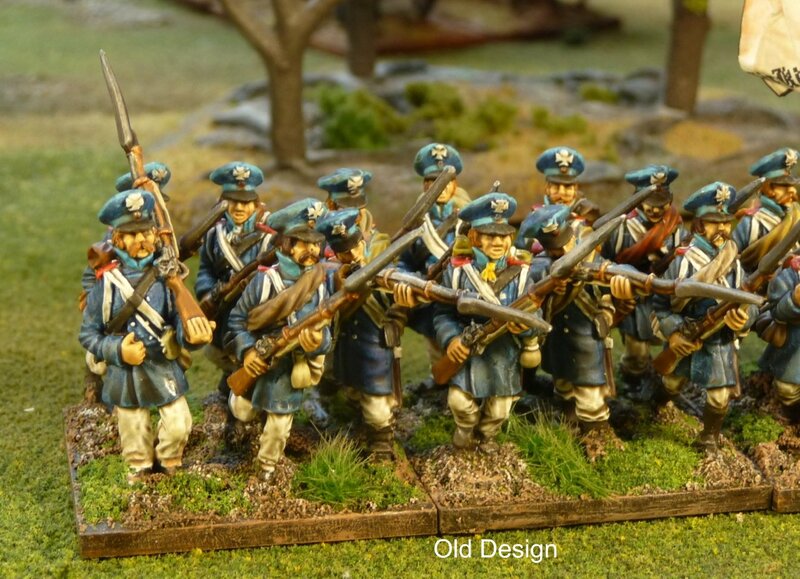 Nice battalion. Will be great to see what they do to Yanicks Froggies. Peters work really has improved since Elite and old Calpe days. It shows big time. They look great....both the old and new! 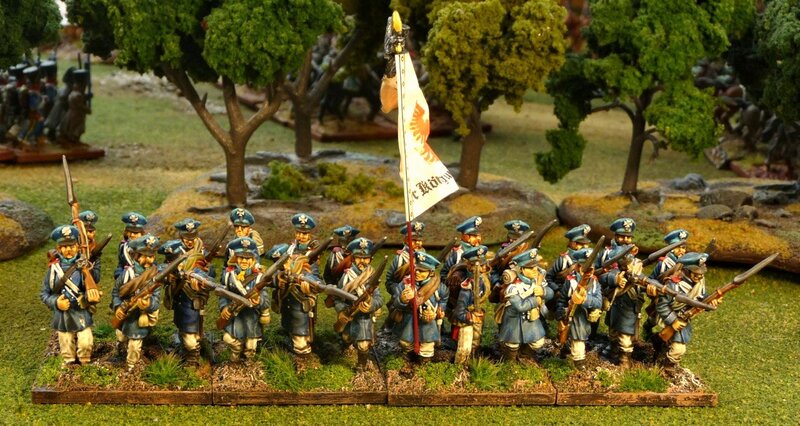 These Landwehr look definitely as the great warriors they were! Honetly... I would have a hard time deciding which ones I like better. I like the general looks and definition about the new ones and the faces on the old ones. So all I can say is... Lucky you! 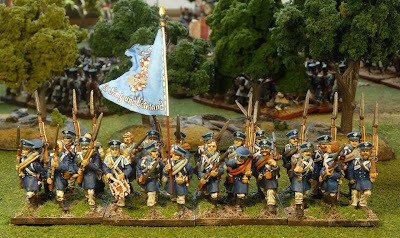 Calpe also sculpted the 1814-15 Prussians that are in the Elite Miniatures range of figures. You might want to check out those figures too.